Les lignes descendantes du motif sur le ventre sont une catastrophe ! 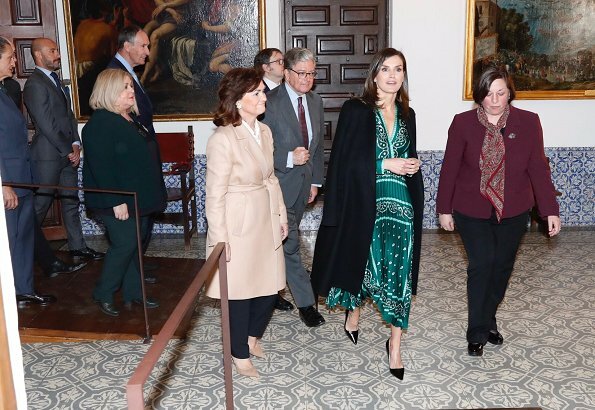 This was never my favorite look on her, I like the top of the dress but not the skirt... but "I take my hat" for the fact that Letizia doesn't have any afraid of repeat any kind of look and some times more than once. And even with this dress, that just on my opinion it's not amazing, she looks very well. Beautiful color, not to keen on the print. But Letizia can carry it off, I think. Oh dear lord NO!!! That dress looks bad on both Letizia and the model. That arch design surrounding the midsection amplifies the hips and backside, which barely has to begin with. And the square design on the skirt looks like it is being pulled downward and sagging. Almost shabby. I like this print, and I also like the color, it would look terrific with boots or bootie type shoes. Kudos for repeating outfits. Her skin looks gorgeous! I love the emerald colour..
Hermoso el color esmeralda. 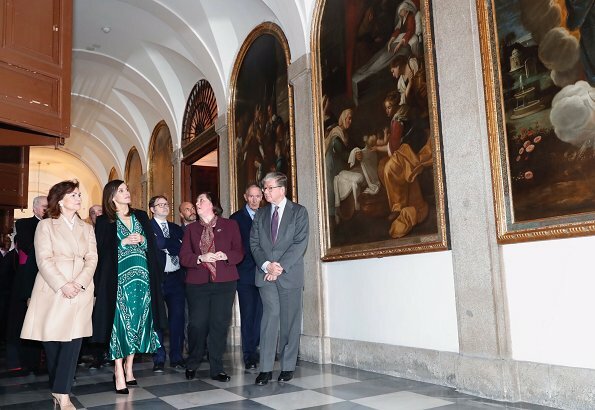 Letizia no lleva muchas prendas verdes, pero le sientan muy bien. 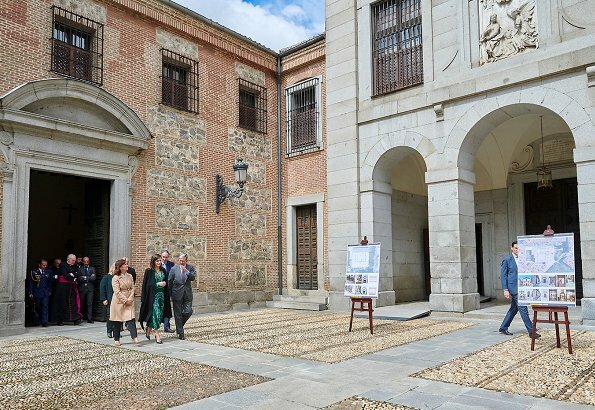 Gran idea facilitar el acceso a los monumentos a personas con dificultades. 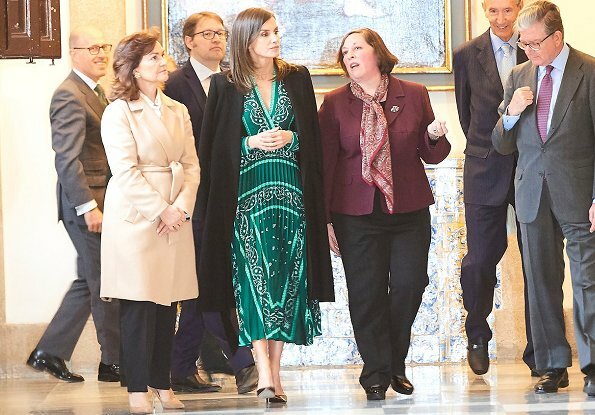 Funny how no one comments on Letizia wearing a coat shorter than her dress. For the record, I don’t mind that combination (depending on the coat and the dress, certainly). But when other royals do this, there are several, numerous actually, people who comment on how they dislike that (Duchess of Sussex’s outings come to mind, but no only gets, same comments appeared for Princess Marie and others recently). Double standards anyone? Bueno, ya está usted haciéndolo ¿no es así? Is this a fashion faux or a fashion pas? Good that she is not wearing it with trainers. 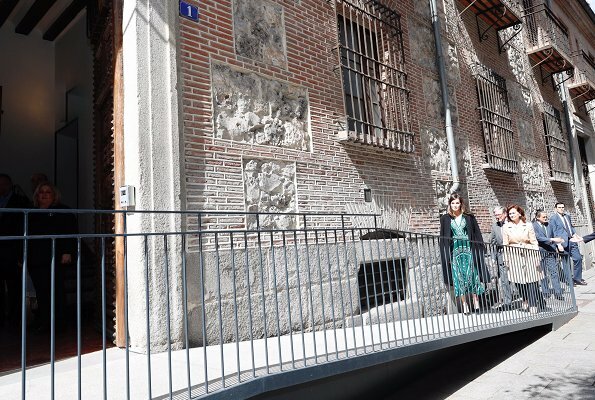 Pues en este país suele ser al reves, si no se ve el vestido parece,que vas desnuda debajo, que decía mi abuela. De hecho en los años 40 que los vestidos eran mas largos, los abrigos siempre más cortos....menúdo peso, un abrigo tan grande! !